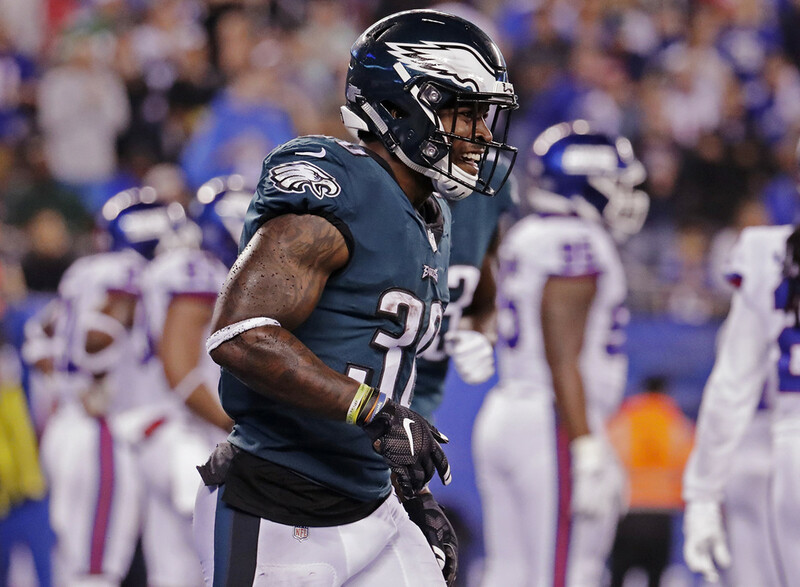 Published: Oct. 14, 2018 at 11:28 p.m.
Wendell Smallwood led the way in snap rate (62 percent) over Corey Clement (36 percent) in place of Jay Ajayi (ACL) in Week 6, but Clement was the more effective back. Per Next Gen Stats, Clement was far better in rush success rate (46 percent) over Smallwood (33 percent) and Clement delivered more yards after contact (2.9; per PFF) than Smallwood (2.4). Clement's promising performance (14 touches, 69 yards from scrimmage, 1 TD) coming off a multi-week injury (quad) obviously bodes well for his future value in a wide open backfield. Of course, Smallwood needs to be owned in all fantasy leagues -- just like Clement. If either of the two are floating on the wire in shallow formats, make sure you place your claim or bid. Smallwood was slightly less efficient than Clement on the ground, but he did lead Philadelphia in snaps, routes run, and touches. Meanwhile, Darren Sproles (hamstring) remains without a timeline for return. Both Smallwood and Clement are on the high-end FLEX radar in Week 7 against a Panthers team surrendering 5.0 YPC (fourth-most). Coming off a ceiling week (5/110 on five targets) against the Dolphins, Taylor Gabriel deserves more attention in fantasy. He's marginally behind Allen Robinson in targets (38 to 34) and air yards (455 to 396; per Next Gen Stats). Gabriel is being targeted on 23 percent of his routes run, the same exact rate as Robinson. The Bears schedule is by no means cumbersome over the next month (Patriots, Jets, Lions, Bills), either. Gabriel is over 90 percent available in NFL.com fantasy leagues. Over the last three weeks, Rogers has finished as the PPR WR20, WR24, and WR21. It's come quietly, but Rogers has carved out a role in the Colts voluminous attack. In this miniature hot-streak, Rogers leads Indianapolis in routes run (137), targets (32), and receptions (20). Andrew Luck (48.0) leads the NFL in pass attempts per game by a mile, opening up volume for everyone in the Colts attack. Luck is on pace to re-set the single-season record for pass attempts this year. What's more, Indy faces Buffalo and Oakland before their Week 8 bye while T.Y. Hilton (hamstring) is still ailing. Josh Rosen has a favorite target. In his first three games as a starter, the rookie Christian Kirk leads the Cardinals in receptions (13), yards (190), Passer Rating when targeted (137.0), and catch rate (82 percent). Per Next Gen Stats, Kirk led the Cards' in routes run (30) for the first time all season in Week 6. Kirk has 70 or more yards in three of his last four games and now faces the faltering Broncos "defense" at home next. Don't ask me how Cole Beasley just dropped 9/101/2 (on 11 targets) on the best secondary in the NFL. I still don't understand it. The Jags' lone semi-vulnerability is against slot receivers -- where Beasley runs 88 percent of his routes (per Next Gen Stats) -- but Beasley's overall WR2 (PPR) finish in Week 6 was completely unpredictable. What is predictable is Beasley's team-leading target share (20 percent). Beasley will be on the PPR WR4 radar in Week 7 against 'Skins slot corner Fabian Moreau, who has been rinsed for a 117.2 Passer Rating when he's the nearest defender (per Next Gen Stats) over the last three weeks. Taylor's usage has been all over the place this season, but he saw another spike in Week 6. It did not show up in the box score (1/13 on two targets) because Marcus Mariota absorbed 11 sacks against Baltimore, but Taylor set season highs in snaps (75 percent) and routes run per dropback (87 percent). The explosive second-year receiver remains an intriguing end-of-bench stash. Tennessee's schedule lightens up considerably from here on out. In Devonta Freeman's last two missed games (Week 4, 6), Ito Smith has carved out a FLEX-viable fantasy role. Without Freeman (knee, foot) in the lineup, Smith (44 percent snap rate) has cut into Tevin Coleman's usage. In those two games, Smith has handled 10 and 13 touches while his 44 percent rush success rate this season leads Coleman (38 percent) per Next Gen Stats. While Freeman continues to battle multiple injuries, Ito Smith needs to be stashed on all 12-team league benches. With Tyler Eifert (ankle) done for the year and Tyler Kroft (foot) facing possible season-ending surgery, Uzomah has a bankable, every-down role in the Bengals suddenly solid attack. In Week 6 without both Eifert and Kroft in the lineup, Uzomah set season highs in snap rate (92 percent), routes run (39), and targets (7). Uzomah will seriously be on the low-end TE1 radar in Week 7 against the Chiefs shaky secondary -- especially with Jimmy Graham, Jared Cook, and Vance McDonald all out on their bye.